Brian Burke and the Toronto Maple Leafs shook up the team's roster by trading six players for big name defenseman Dion Phaneuf, winger Fredrik Sjostrom and prospect defenseman Keith Aulie from Calgary and netminder Jean-Sebastien Giguere from Anaheim. To acquire Phaneuf and company, Toronto sent defenseman Ian White and forwards Matt Stajan, Nick Hagman and Jamal Mayers to the Flames. For Giguere, goalie Vesa Toskala and winger Jason Blake we packaged to the Ducks. In the Phaneuf deal Toronto takes on more than $8 million in salary ($6.5 million which is owed to Phaneuf through the '13-'14 season), and sends just shy of $7 million in salary to Calgary. From a cap standpoint, it works for everyone. Who wins in this deal.? 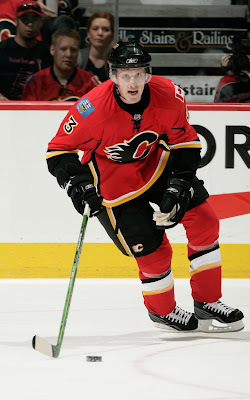 The Flames receive Ian White who's offensive production is nearly on par with Phaneuf's and at a fraction of the cost. White becomes a RFA at season's end. In Hagman, the Flames get a player that has experience playing with Olli Jokinen, whom Calgary has had problems finding linemates to mesh with. Stajan and Mayers can play the uptempo game the Flames need. Toronto essentially did not have to give up much to land a "star" player, but with Phaneuf's recent reported rift in the locker room in Calgary, coupled with his sub standard play the last two seasons, make him just seem more like an over-hyped player with an albatross contract than the "future Norris Trophy winner" he was once thought to be. To acquire Giguere Toronto had to accept his $6 million cap hit, but sent Toskala and Blake's $4 million each to Anaheim. Blake seems to finally have run out of gas and Toskala is as inconsistent as they come in net. 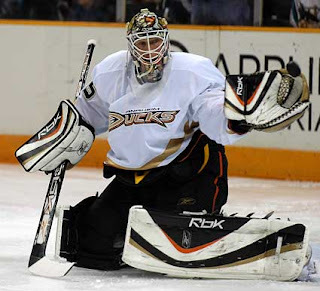 Giguere lost his starting job in the playoffs last season and had not been able to wrestle it back from Jonas Hiller. However, Giguere has a Stanley Cup ring on his resume and there are more egregious contracts for goaltenders in this league. We still see Brian Burke's plan in place to shape the Leafs in to a tough team to play against... but is anybody sold on them being any better? Solid analysis. I totally agree that Toronto is the winner of their exchange with the Ducks, but a big upside still exists for Anaheim. While heavily plagued in the pressure cooker of T.O., a return to CA might be the thing to rejuvenate him and give the Ducks a great (and potentially cheap after this season) buckup for Hiller. It's a risky but potentially very clever move by Bob Murray. Thanks Rick! If nothing else, Toronto has made it fun to talk about them!